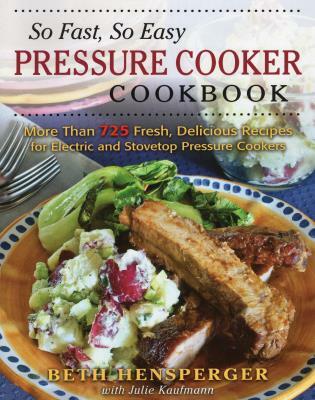 The only pressure cooker cookbook--for electric and stovetop pressure cookers--you'll ever need! Because no moisture evaporates during cooking, conventional stovetop recipes do not work in the pressure cooker. For success, the pressure cooker requires different food to liquid ratios and because of that superheated pressure, cook times are very precise. With this comprehensive guide, the busy cook can use fresh ingredients to create more than 700 tasty recipes developed for and scrupulously tested and retested for the pressure cooker. Chapters on Poultry, Pork, Beef & Veal, Lamb & Game, and Seafood include Zinfandel-braised short ribs that cook in just 30 minutes, herb-stuffed whole turkey breast and braised lamb shanks ready in 25 minutes, and baby back ribs that pressure-cook in just 15 minutes. Individual chapters on grains, beans, rice dishes (including risotto and breakfast rice), potatoes, chili, and tomato sauces (with and without meat), as well as on soups, vegetables, desserts, making your own baby food, and much more. An introductory chapter explains the ins and outs of the pressure cooker, with valuable tips and advice. The authors also include recipes for lots of basics, such as how to cook different types of rice and varieties of dried beans. Beth Hensperger is the author (with Julie Kaufmann) of the bestselling Not Your Mother's Slow Cooker Cookbook, as well as other top-selling appliance cookbooks, including The Bread Lover's Bread Machine Cookbook and The Ultimate Rice Cooker Cookbook (co-authored with Julie Kaufmann), now in its second edition. Beth is also an expert baker and has written for Food & Wine, Bon Appetit, Cooking Light, Every Day with Rachael Ray, and other online and national magazines. Julie Kaufmann spent her first career in journalism, including nine wonderful years as an editor on the award-winning Food & Wine section of the San Jose Mercury News. She is co-author with Beth Hensperger of The Ultimate Rice Cooker Cookbook, Not Your Mother’s Slow Cooker Cookbook, and Not Your Mother’s Slow Cooker Recipes for Entertaining.